Sinking Slab? 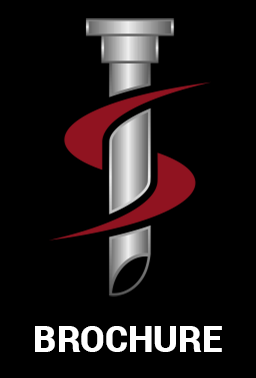 At Florida Foundation Systems we are your source for Void Fill and Slab Lifting. From pool decks to seawalls to generator pads to commercial warehouse slabs, poly void fill/slab lift is your convenient and cost effective solution for filling holes and lifting concrete. Call today for a free estimate! 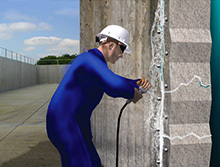 Poly foam leveling is the newest and most efficient concrete repair technique available today. We use lightweight polyurethane foam to fill voids under concrete slabs and lift them back to their original level. 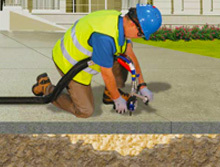 It is useful for foundation repair and soil stabilization, as well as filling voids under swimming pool decks, patios, walkways, sidewalks etc. How do I know if I need Polyurethane Fill? Incorrect grading, poor drainage, excessive rain, and many other factors can contribute to soil settling or washing away under your slab. 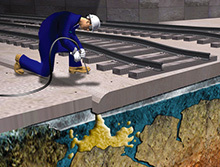 Voids may appear under the slab, contributing to slab settling and/or cracking. Home and business owners should note such voids even if they are small as they can enlarge over time, causing damage to the concrete slab. Filling the void can repair the issue and keep the area from settling further. If the slab is already damaged it can be lifted back to its original position. Concrete slabs settle due to voids or unstable soil. By pumping polyurethane foam through the concrete, you essentially push the concrete slab back up from below. First, small holes are drilled through the area to be filled, then the foam is injected under the slab, filling the void and lifting the slab back to a level position. 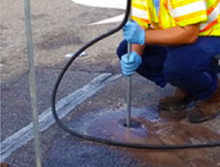 After the injection, the holes are patched with concrete and the area can be used immediately – no waiting for drying or curing. What are the benefits of using Polyurethane Foam? Using polyurethane foam is very cost effective, environmentally friendly, and causes very little downtime. Most jobs take only a few hours and can be walked on immediately. The costs involved are often much less than demolishing and replacing concrete. What can I expect when Florida Foundation Systems comes to repair my slab? Our Slab Fill experts will arrive at your property in a marked truck towing a trailer that contains the necessary chemicals and equipment needed for your job. The truck and trailer remain parked while the foam is applied with a hose by our certified foam injection crew. They will drill small injection holes in the concrete and then pump the foam into the void beneath, filling it and raising the slab, if necessary. Depending on the size of the repair needed, repairs can take as little as a couple of hours and the surface can be used immediately following the process.